Want to Eat Fresh? How to Create the Perfect Home Garden | Global Garden Friends, Inc.
Finding ways to eat a healthy and balanced diet is very important. If you are trying to improve your diet, one of the best things that you could do would be to eat fresh veggies and fruit from your own home garden. This reduces your exposure to pesticides as well as encourages the use of vegetables in your daily diet. When you are looking to make a home garden on your property, there are several tips that should be followed to provide you with healthy and fresh produce. For your garden to be healthy, you will need to make sure that it gets plenty of water. The amount of water that you need will vary considerably from one area of the country to the other. If you live in an area that is very dry, you may need to consider an irrigation system to ensure frequent and even watering. Also, you should do some research to make sure you understand how much water each one of your plants needs as actual water needs will vary from one plant to the next. Find plants that will grow best in your climate and consider an automated sprinkler system as a way of maintaining consistent irrigation. While you can build a great garden, it can all easily be taken away by a rabbit, deer, or other local wildlife. Birds and bugs are also a concern that you’ll want to consider. Because of this, you need to make sure that your garden is properly protected. By putting up a fence around your garden, you can keep out the larger animals like deer and rabbits. Netting can be put over fruit trees to keep out the birds, or you can hang cd’s to reflect light and scare the birds away without fear of them getting their feet caught as they could in a net. If you don’t want to use any sprays on your plants, considering using a sonar device that emits high-frequency sounds that only bugs can hear that will keep them out of your yard. Ladybugs, daddy long legs, and other natural insect predators can be introduced to your yard to keep out the bugs that would otherwise eat your produce. One of the most important part of the gardening process is when you are going to plant the initial seeds. While the seeds seem very small, they will soon grow into roots and full plants. Because of this, you need to make sure that they have the room they need to grow. Read the instructions that come with your seed packets or do research online to know how much space is required for the plants you purchase, and make sure that you are planting them at the proper depth, as well. Proper spacing will go a long way towards keeping your plants healthy and preventing them from having to compete for resources in the soil. 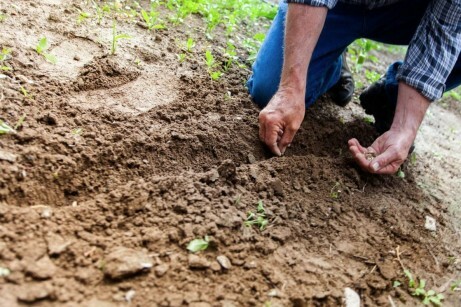 When you are looking to improve your garden, it is important that you have good soil to work with. Often times, this will require that you remove the old soil to be replaced with more nutrient-dense varieties, as well as taking out any weeds, previous vegetation, and rocks. When you are going to do this, you should hire a rubbish management service to haul out all of that material in a rented bin, allowing you to fill as needed throughout the project. Ensure you get a professional service that knows how to deal with organic matter in an eco-friendly manner, and discuss options for separating out organic matter like rocks and dirt from any packaging you may need to dispose of from transporting dirt or other materials for your garden construction. When you are looking to make your own home garden, ensure that you have all of the information and materials you need ahead of time. Plan ahead for your needs in terms of space and what sort of foods you want to be growing, and make sure you know what sort of recipes you can incorporate your produce into so that you don’t get overwhelmed and lost when harvest comes. Most people that are new to gardening will pick up tips and tricks along the way, but much of the trial and error can be reduced by planning in advance.